Fellow bloggers, Cote de Texas & La La Linen, eat your heart out, this is right up your alley! This is the first crib bedding set that I have seen that has such a vintage french vibe. 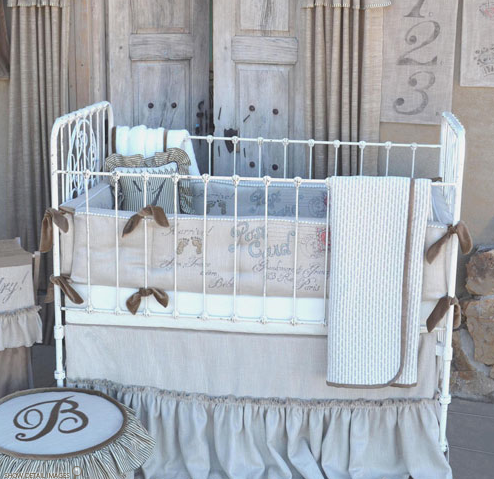 It looks great with any iron crib and linen accessory. Bella Notte and Matteo Linens were always my go-to before but this is a nice alternative if you want some pattern and little color variance. This French Farmhouse set is available for $615 from Post Tots and is overflowing with linen and vintage inspired detail. What wrought iron crib is that? I am searching for a wrought iron crib that will show off the crib bedding I purchased!